When José Mourinho was appointed manager of Manchester United in May 2016, many feared his arrival would spell the end of the popular Juan Mata’s time at the club. In case you’ve forgotten, Mourinho managed Mata at Chelsea and afforded the Spaniard very limited playing time which led to United signing Mata from the Blues. It was said at the time that Mata didn’t fit Mourinho’s style of play because of a perceived lack of work rate and strength. Given that history between the two, the idea that Mata’s days at United were numbered when Mourinho took control of the club seemed a reasonable one. To the surprise of many then, Mata has been a mainstay of Mourinho’s United ever since the Portuguese came to Manchester. Positioned on the right of United’s attacking midfield trio, Mata were largely present in most games last year but this season in particular. So far, the technician has started every Premier League game bar the game at Stoke City. It should be mentioned that United have won six out of seven games, the draw at Stoke the only exception. So from Mata’s six starts he’s recorded six wins. His influence is actually greater for United now under Mourinho then he ever was under David Moyes or Louis van Gaal. Mata is largely seen as a traditional number 10, operating just behind a striker or strikers with little defensive responsibility. The fact though is that Mata has spent more time as a left-sided attacking midfielder (Valencia) or right-sided attacking midfielder (United) than as a central playmaker. It’s really under Rafa Benitez’ tenure at Chelsea when Mata was deployed centrally regularly. As a player, Mata is sublime technically, extremely intelligent, his movement is fantastic, he scores goals and as this post will show, he contributes to the defensive phase too. As I outlined above, Mata starts from as a position on the right of United’s attacking midfield trident, most often involving him, Henrikh Mkhitaryan centrally and Marcus Rashford on the left. They balance each other quite well; Mata is a superb goalscorer in the box and always keeps the ball moving with simple yet effective passing, Mkhitaryan adds dynamism, creativity and pace while the directness of Rashford in beating opponents and stretching teams vertically with his pace is a major feature of United’s attacking play. The trio is also balanced well by their full-backs with the inverted movement of Mata being compensated by the attacking Antonio Valencia while Rashford’s rather wider deployment suits Daley Blind/Matteo Darmian who are both less effective in attack and therefore can sit back a bit more or move more centrally. Below is an example of where Mata is usually stationed; the right half-space. Rashford and Mkhitaryan are highlighted too, although they’ve swapped positions on this occassion. Mata’s movement is probably his most important asset to this United. He constantly moves across the pitch to make himself available and create numerical superiority for United around the ball. His fluidity allows United’s passing to be quite varied and the positional fluidity of Mata and Mkhitaryan makes it difficult for opponents to get a grip of United’s attacker. The video below is a perfect illustration of how Mata is near always moving in United’s attacking phase to create a passing option for his teammates. As shown above, Mata’s intelligence when making little adjustments to his positioning is fantastic. What is quickly highlighted in the video is one of his key contributions to United’s attacking play; his runs in behind. This is not something you’d associate with a number 10 of Mata’s slight physical stature and with his relative lack of pace but Mata times his runs well to attack the space behind the defence. Usually, as you’ll see in a second, Mata makes the run from the right diagonally towards the left and tries to attack space between two defenders off the blindside of the ball-near centre-back. Even if he doesn’t receive the pass, the run will have forced the defensive line back but then there is probably space between the defensive and midfield lines of the opposition for the likes of Mkhitaryan or Paul Pogba to exploit. A few examples are highlighted below, note the timing of those runs which is near perfection. Mata’s ability to find space in the congested space of the penalty area is at the level of world class poachers like Alberto Gilardino or Filippo Inzaghi. He reads the game superbly and finds any vacated space to become an option. Mata’s goal against Crystal Palace, his first for the season, from the weekend is a case in point. As Marcus Rashford makes his way towards the line, Mata adjusts his run from attacking the far post as Rashford is unlikely to play a high cross with his left-foot. Instead Mata makes a diagonal run backwards towards the penalty spot where he becomes a great option for Rashford who’s pass is perfect and the finish is excellent. 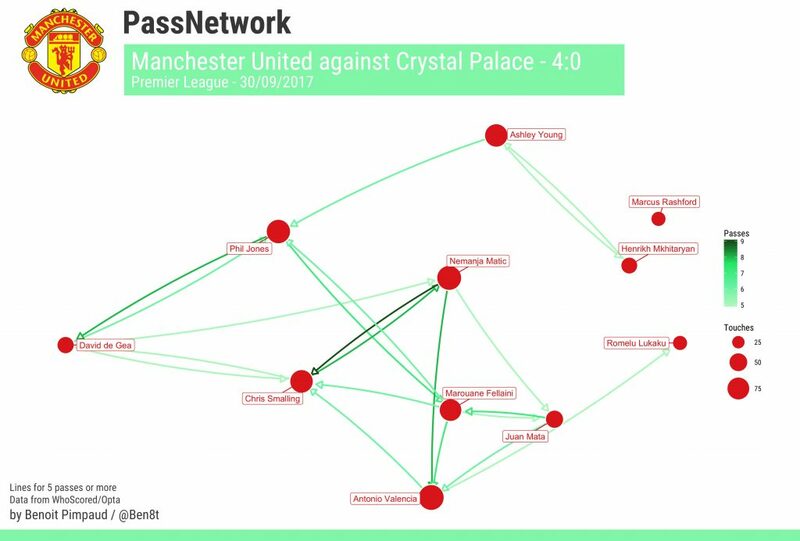 As these pass maps from United’s wins against West Ham and Crystal Palace highlight, Mata’s primary positioning is in the right half-space and sometimes even more centrally. In fact, he’s as central as Pogba and Marouane Fellaini. It’s evident that Mata’s largely free movement benefits United’s passing game and penetration in the final third with his runs in behind. The Spanish magician also boasts jaw-dropping technique to marvel at and the occasions when Old Trafford reacts to a sublime piece of skill by Mata are common. His first touch is excellent and his intelligence means he’s a safe bet to give the ball to even in pressured situation and trust him to solve the problem. When moving centrally, Mata helps linking play also in deeper areas from where United then can progress their attack, like in the example below. Then we come to this point. Is Juan Mata bad defensively? Depends on who you ask I’d say. If you compare him with more energetic pressers in the league then he certainly isn’t one of the best. But in this United team he fills an important role. In a team packed with attackers where Nemanja Matic is really the only defensive minded player in the midfield setup, Mata’s intelligence becomes key. Given Pogba’s free-spirited style of play where he very often goes all the way into the penalty area, Mata reads situations like this to help Matic in the middle. We’re not talking about making tackles or interceptions here, just running into the middle to prevent opponents progressing their attacks. Given his lack of strength and pace, Mata will never be someone who imposes himself physically on opposition, but he’s intelligent enough to sense when he’s needed deeper. In the video below, you see one tackle which sets up a great opportunity and a recovering run to help out the stranded Matic in midfield. Note the distance Mata makes up on his opponent. Juan Mata is very important to José Mourinho’s Manchester United, despite being deemed surplus to requirements under the same manager at Chelsea. Mourinho has said that the situation now is a totally different one and that he’s seeking a different profile of his team where Mata seemingly is an important part. Against the toughest opponents Mourinho will likely drop the Spaniard to include an extra central midfielder but Mata has been key in United’s explosive start to the season. His movement, his technical quality and his intelligence are attributes which makes Manchester United a better team and shows second chances can pay off in ways you might not have imagined. Mourinho gave Mata another chance, and the likeable Mata certainly took it.